As at this time certain preparations of the enemy on the Greek front became noticeable, a certain amount of uneasiness was felt. On this occasion I had to start for the Western front in great haste without having been able to complete the arrangements for Nureddin Pasha s appointment and his departure for his new post. I left this to Ismet Pasha, Chief of the General Staff, to attend to and ordered him to carry out all the necessary formalities. The enemy had actually begun his attack along the whole line. Our troops retired. When Nureddin Pasha saw how unfavourable our position at the front was, he told Ismet Pasha that before he could accept his post the Government must consent to certain conditions. For instance, the Government ought to ask for the opinion and agreement of Nureddin Pasha before coming to a definite decision on important questions relating to the administration of the country. For among those who formed the Government of the Grand National Assembly were ap parently some young men and not experienced persons like Tewfik Pasha and certain others who had reached the age of wisdom. Ismet Pasha, finding these ideas somewhat strange, immediately sent me a telegram about the matter. 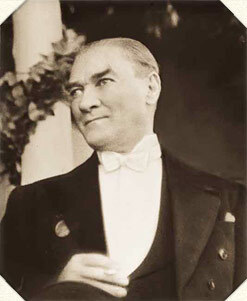 As for myself, I found it significant that Nureddin Pasha had put forward these requests at the very moment when the general position had become critical, while he had abstained from doing so at the time I offered him the appointment. In the reply I sent to Ismet Pasha, I ordered that no office was to be entrusted to him. I also looked upon the contents of a letter that Nureddin Pasha had sent me two days after the Greek offensive had begun as being rather strange. If you like I will read the letter to you. The manner in which I have been dismissed from the appoint ment of Commander and Governor as well as the way in which my dismissal has been conveyed to me, are regarded by me as offensive. I beg that Your Excellency will allow me to tell you that in my opinion it is dangerous for the nation and the country when an ob- servation inspired by patriotism and put forward by an official of the State is not entitled to be discussed or even listened to; further, when there is no inclination to wait or allow or even deem it necessary that the Grand National Assembly and their Executive Council should express their opinion, but on the other hand to follow the conceptions and wishes of the very limited number of two or three persons and, if I am not very much mistaken, to administer the affairs of the country in such a spirit. As, under the present conditions I think I must be very doubtful about accepting an appointment and can see no advantage in our working together, I hereby inform you that I shall leave Angora by the next train and shall settle down at Brusa, my native town. I per mit myself on this occasion to bid Your Excellency farewell. 25 th June, 1920. To Brigadier-General Nureddin Pasha. Reply to your letter of 24 th June. President of the Grand National Assembly. Nureddin Pasha did not go to Brusa but to Tash-Kopru, where he stayed for a long time. Later on, we shall meet him again under different circumstances, about which I shall speak at the proper time. The first decision arrived at by the recently formed Government of the Grand National Assembly of Turkey was to send an Embassy to Moscow. It was under the leadership of Bekir Sami Bey, Minister for Foreign Affairs. Yussuf Kemal Bey, Minister of Economy, was one of its members. The chief object of this Embassy, which left Angora on the ir th May, 1920, was to establish relations between Russia and ourselves. Although certain essential points in the Treaty that Russia wanted to make with our Government had been agreed to on the 24th August, the actual signature to the Treaty was post poned on account of certain details about which no agreement had been arrived at, concerning some matters that affected the situation. The signing of the document, known as the Moscow Treaty, was not possible before the 13 th March, 1921. The first general offensive by the Greeks, which began immediately after the insurrection which took place almost throughout the country, necessitates our looking westwards once more.